Another boat name request we got a few weeks ago. They still need help, but first a word of caution... Helping think of boat names for this one might make you thirsty. Oh hell, it's 5 O'Clock somewhere! 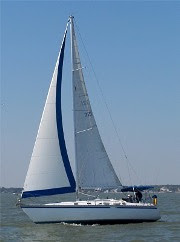 My husband and I just bought a Hunter 34 sailboat, and are trying to think of a name. We both like to drink Martinis and were thinking of naming it "Tee Martoonis". We wanted something unique that would make people stop and think and laugh about it. Any other suggestions would be greatly appreciated! Saw a speed boat named "Shaken not Stirred" on a trailer on the highway. They had the word "Shaken" in big red letters and it made it look really fun.